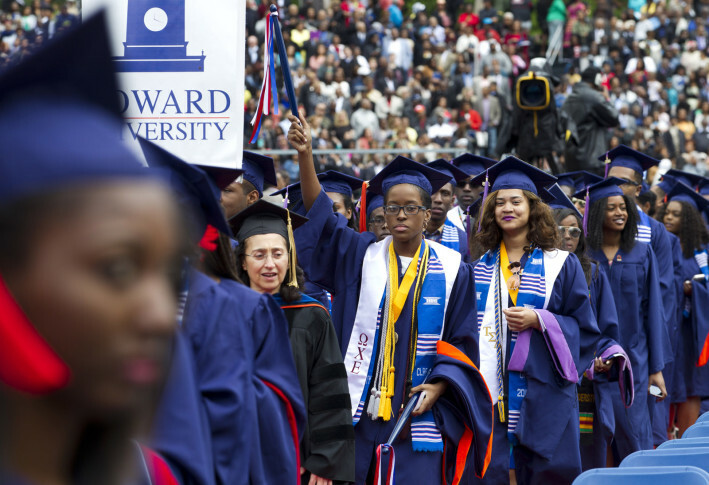 WASHINGTON — Howard University’s national ranking saw one of the biggest jumps of any school rated in this year’s Best Colleges report from U.S. News and World Report. Howard advanced 11 slots on the nationally ranked universities list to join another D.C.-based school, Catholic University of America, plus three other schools to tie for No. 124. Howard also ranked No. 2 among historically black colleges, according to the 2017 report released on Tuesday. Spelman College ranked No. 1. The rankings are based, in part, on class size, freshman retention, graduation rates and faculty resources. Johns Hopkins University ranked the 10th best university in the country and was also considered one of the best values of any school in the country. Students receiving need-based financial aid paid about 55 percent of the full cost to attend the Baltimore school. Georgetown University and the University of Virginia ranked 20th and 24th nationally. The College of William and Mary ranked 32nd. University of Maryland at College Park, Virginia Tech, William and Mary and U.Va. were all listed among the top 30 public universities in the country. For parents and students looking for a combination of strong academics and affordability, Georgetown, U.Va., Gallaudet University, Virginia Military Institute, and Washington and Lee University all ranked highly for overall value. Washington and Lee ranked 11th for the top liberal arts schools followed by the U.S. Naval Academy, which ranked 12th tying with four other schools. Several schools in the D.C. region were noted for their innovative changes to curriculum, technology or campus life, with the University of Maryland at Baltimore County near the top of the list. George Mason, U.Md. at College Park and U.Va. also made the list, which is based on nominations. Princeton University, Harvard University, the University of Chicago, Yale University and Columbia University rounded out the top five schools ranked nationally. Among liberal arts colleges, Williams, Amherst, Wellesley, Middlebury and Swarthmore rounded out the top five, according to the 2017 rankings.